Feng Office can act as a web mail client for its users, which is really useful as you will then be able to have your clients and projects associated with all emails related to them. You are also able to share your emails with your colleagues without actually having to forward them. Need their opinion on what to reply to a tricky question? Just subscribe them to the exchange and they will be able to read each individual mail in order without reading from the bottom and having to trawl past repetitions of some of them, over and over again. You can then use the comments sections to discuss, exchange views, and decide on the best approach. If you later realise someone else could be of help add them too, and they will instantly access both the emails and the previous discussion among your colleagues. What happens if you are off to an important meeting, but your colleagues are waiting for some guidelines from your contact on an urgent matter? If you have classified the relevant incoming and outgoing emails into the right Project, Client, Folder or Workspace - as long as your colleagues have reading access to e-mails in there - they will be able to receive these guidelines and act on them as soon as they arrive. Email rules, which will classify your emails automatically to the right Client, Project, Folder or Workspace. Group mailing, to send one email to all your contacts or users of Feng Office. Note: The Email module is not automatically activated on our Free Trials, due to the possibility of misuse and/or abuse of the module, and thus having effects on our servers. If you would like to test out our Email module on your Free trial, please get in contact with us. 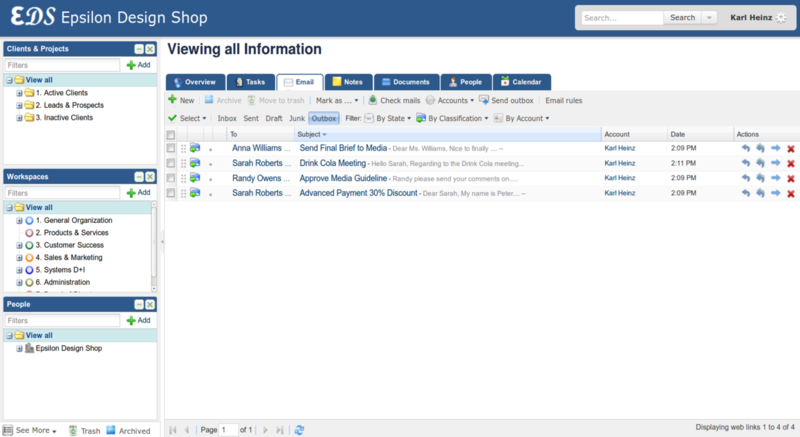 E-mail integration module relies on the users mail server. The service provided is for downloading e-mail into Feng Office, classifying it, and integrating it within Feng Office system and DataBase. This means you need to possess an email account before setting it up within Feng Office. Contact us to get your Email module today! For more information on the Email module visit our Email module Manual or contact us!